Duranta erecta is an erect shrub widely cultivated as an ornamental garden plant and hedge plant. 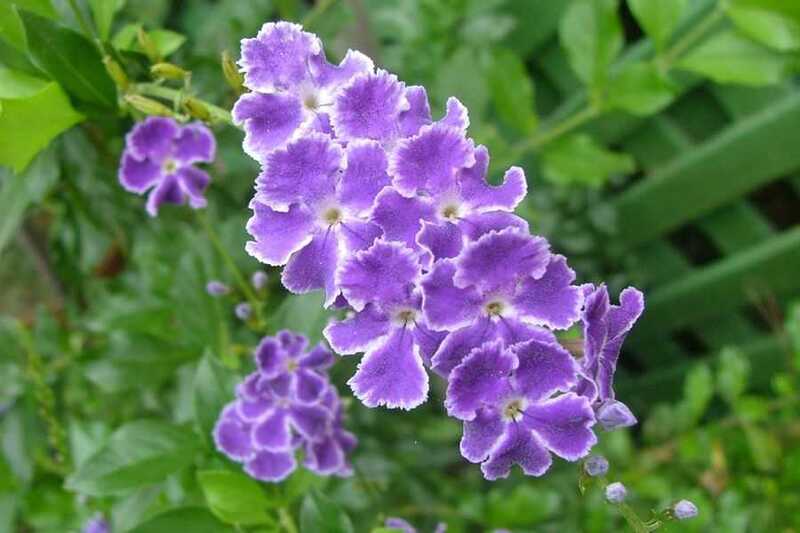 Do you have a space you want to fill quickly; Duranta is a perfect choice plant as it grows rapidly. Plant is however considered an invasive species in Australia, China, South Africa and on several Pacific Islands. Some cultivars used include Sheena’s Gold, Geisha Girl, Alba and Variegated. These cultivars are less invasive and they all belong to the line of Duranta Erecta. The shrub thrives best in well drained, moist fertile soils. Duranta is best propagated using soft wood cuttings which are dipped in rooting hormones to enhance root formation. When you’re planning to propagate Duranta, you need to acquire already established seedling from a nursery bed operator. Alternatively you may raise your seedlings but would take you some time before you get the seedlings. To raise a seedling take cuttings about 6-10 cm long just below a node on the stem of an already existing Duranta. Make sure the cutting comes from healthy stock. Remove most of the leaves on each cutting leaving about 3 healthy leaves at the top. Place the cutting in a green house or in a cover for 3-4 weeks to allow it to root and have new sprout. After doing all this there is one routine you need to adhere to and that watering the cutting. After you have acquired a seedling, dig a hole of about 60 cm deep. Mix 2 parts of top soil with 1 part of compost and add it in the bottom of the hole. Then remove the seedling and place it into the hole. Water the seedling regularly to reduce on the transplanting shock. Then wait patiently as you watch your Duranta grow vigorously. The major grooming activity associated with Duranta is pruning. The shrub is a vigorous grower so it needs trimming often to shape it. The shrub can be used to make topiary or even create boundaries in spaces that need to be filled in the lawn. Raising Duranta is such a fun and easy process. Open up 60cm deep ditch; mix 2 parts of top soil in one part of compost. Unwrap the root ball of your Duranta seedling to remove a polybag. You can seat the root ball in water to ease release of the polybag. In a well prepared planting hole, place in your seedling. Water the seedling immediately and regularly as possible to stop the transplanting shock. Prune to keep your vigorously growing Duranta in shape and neat.